Description: Roberval & Saguenay GP38-3 63 parked at the locomotive shop at the Rio Tinto plant in Alma, Quebec. Description: This new BNSF #1272 (3GS21B) was on the Evansville Western(EVWR) side track near the BNSF Beardstown Sub. diamond. 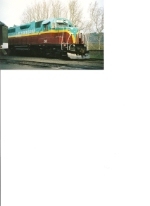 It was connected to a rebuilt EMD GP38-2 for the Mississippi Export Railroad(MSE) #67. These were recently build at the NRE shops at Mt. Vernon, IL. Description: A "Rare" Run on the Mississippi Export Railroad for this Sunday afternoon as they just got done picking up cars from the CSXT Interchange port in Pascagoula. I would chase this train for a few miles! Description: 2nd picture of this chase as I get him just before they cross the Pascagoula River. Description: Mississippi Export Railroad Train making their way crossing the swing bridge as they get ready to enter the yard limits. Description: HZGX 193 rolls to a stop on the main as a northbound coal creeps into the siding. Title: HZGX 193 leads a rock train Sb. Title: HZGX 193 heads Sb down the bnsf hannibal sub. Description: A neat little thing. Description: HZGX 193 MPM XXVI comes into the BNSF La Crosse, WI yard. Description: HLCX 347 is ex-UP 347, rebuilt to GP38-2 from D&RGW GP40 3081. Description: HELM 347 leads a two-unit local with UP 368 at Gowrie Iowa on a hot summer day. At one time the small town of Gowrie had seven lines from four roads radiating out of it. It's now down to the a single through path, the north/south route that was once part of the M&StL. The old east/west CNW tracks survive from here to serve elevators. Grain and ethynol appears to make up most of the traffic these days. Description: These 2 units are doing switching in the Muncie Yard. Description: This diesel has a very long history and has worn quite a few reporting marks and numbers. In September 1970 EMD delivered this unit to B&O as GP38 4805 and after the CSX merger 3805 became 2105. In November 1991 this unit was wrecked, retired, and sold to NRE for rebuilding emerging as GP38-2 CNW 4705 on long term lease. This Geep went through another merger and emerged on the other side as UP 2064 in May 1995, then UP 1904, UP 370, and finally UP 404 in August 2001. In October 2003 UP retired this former B&O/CSX/CNW Geep and she went to CEFX. After some quick patching this old timer is back out on the road in lease service spotted working on BNSF rails but still in CNW dress.